you use a 30 ft cable choose one of the versions with 1 nF or 1.2 nf capacitor. See note 6 below. Probably the easiest part of the treble bleed modification is the installation. See the diagram? 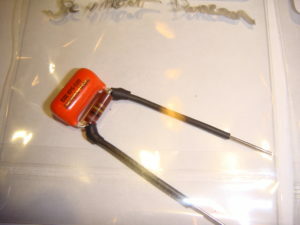 simply solder the connection to your volume pot or volume pot(s) as shown. Guitars with two volume controls will need two circuits. 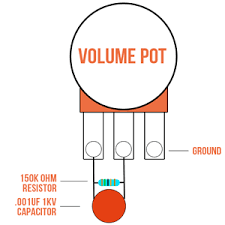 However, a parallel resistor affects the taper of the volume pot. This results in a more gradual change of volume across the range of the volume knob (i.e. it will give you less volume change between 10 and 7 and a faster volume change between 1 and 3). Personally, I am long used to this and find un-altered circuits change volume too drastically without it. 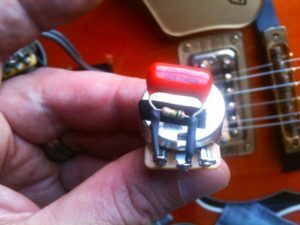 Volume swells can be less smooth at the lowest numbers on the volume knob, particularly for high gain players. No such thing as a free lunch, eh? Everything is a compromise, all the time. Some of this change can addressed with the Fender mod of adding an additional series capacitor in the 20 kΩ to 50kΩ range. (see note 6 below). 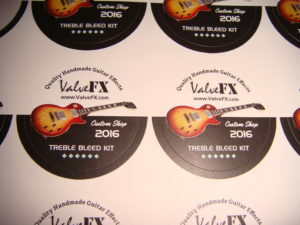 These values (1 nF & 150 kΩ) are sold by Stew Mac and ValveFX as a their “Golden Age Treble Bleed Circuit”. Personally, I currently like the DiMarzio values (560 pF & 300 kΩ). With a Planet Waves 10ft cable, depending on which effects pedals I am connected to it is either tonally neutral to my ears or introduces a slight but pleasant increase in brightness at low volume pot settings. In my circuit simulations, this combination also produced the smallest change in volume pot taper of any of the parallel resistor/capacitor combinations (though it is still a very noticeable change).